The Detroit Lions visit the Green Bay Packers in Week 9 of the 2017 NFL season. PFF previews the top player matchups of the game. QB Matthew Stafford vs. CB Kevin King – After several consecutive weeks of poor play, Stafford finally got back into the swing of things this past week, earning the fifth highest game grade among quarterbacks with a grade of 82.8. Over his last two games, Stafford hasn’t been shy trying to connect on deep balls, attempting 15 passes 20 yards or more beyond the line of scrimmage, no quarterback over that stretch has averaged more per game. On those passes, Stafford has been effective, producing a passer rating of 115.3. This week, Stafford will most certainly test struggling rookie cornerback Kevin King who is coming off a brutal performance in which he gave up five receptions on five targets for 143 yards and a score. Three of those receptions were on targets 20 yards or more downfield. G Graham Glasgow vs. DI Kenny Clark – Glasgow is coming off his best game as a pro, earning a game grade of 84.6 in Week 8, the fourth highest grade for guard on the week. He will need to stay hot if the Lions plan to slow down Kenny Clark, who has been one of the best interior defenders in the league, and ranks eighth with an overall grade of 88.1. He has been especially disruptive in run defense, racking up the fifth most run stops among interior defenders with 16. Conversely, Glasgow, who ranks 26th overall among guards with an overall grade of 71.3, has struggled as a run blocker (51.3 run-block grade). T Rick Wagner vs. Edge Clay Matthews – Even though Wagner has been banged up for the past few weeks, he is still performing at a high level and currently ranks inside the top-12 positionally with a grade of 80.5. He has been solid as a pass protector and over the past two games has only surrendered five pressures on 96 pass-block snaps. With the Lions looking to get the ball downfield more, they will need to protect the passer better. Fortunately for them, the Packers have been lacking a strong rush from the edge this season. Matthews, who lines up almost exclusively on the left side to rush the passer, has been disappointing rushing the passer and has earned a 7.1 pass-rush productivity, which is well under the 9.1 league average. While his 82.6 overall grade is the best among Packer edge defenders, a good chunk of his positive plays has come in run defense. RB Aaron Jones vs. LB Tahir Whitehead – In his four games of action, Jones has racked up 10 missed tackles forced and posted an elusive rating of 40.0, which ranks 20th among running backs during that span. He’s also shown plenty of explosiveness, ripping off five runs of 15-plus yards. Most of his production on the ground has come when he’s attacked the edge. He’s racked up 222 rushing yards on 30 runs outside of the tackles. Whitehead leads the Lions with 14 run stops. He’s ranked ninth among linebackers with a run-defense grade of 85.2, and his combined tackling efficiency of 16.3 ranks 14th. T Bryan Bulaga vs. Edge Anthony Zettel – Bulaga has struggled in his limited time this season, ranking 44th among tackles with a PFF overall grade of 64.7. He’s allowed 11 total pressures and his pass-blocking efficiency of 92.5 ranks 59th. In addition, he has a run-block grade of 43.3. Zettel ranks 12th among edge defenders with a run-defense grade of 85.4. His 12.7 pass-rushing productivity is 10th, and he has a run-stop percentage of 7.1. WR Randall Cobb vs. CB Quandre Diggs – In his first start against the Saints in Week 7, Packers quarterback Brett Hundley completed just one of five passes that traveled 10-plus yards past the line of scrimmage. 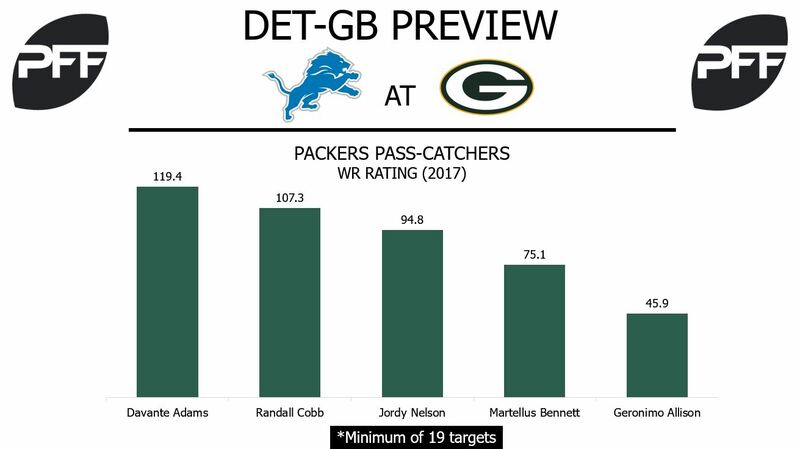 If a focus on targeting intermediate routes carries into this week, Hundley may look to often target Cobb out of the slot. Cobb has caught a team-high 20 passes for 187 yards out of the slot this season. He ranks 13th among receivers with 171 yards after the catch. Diggs has allowed 15 receptions on 25 passes into his coverage for 237 yards and three touchdowns. He’s given up 184 yards after the catch, which is the third most among cornerbacks.